Boasting clean lines and elegance, OVERLAP Table is all about mobility and working with laptops and tablets safely. 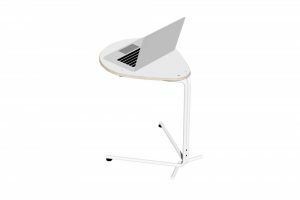 Perfect for informal learning environments – just sit down and slide one over to work at a relaxed height. Drop OVERLAP Tables into your space and they become immediately useful. centring of your laptop directly in front of you. Elegant, yet built with a solid and sturdy frame.